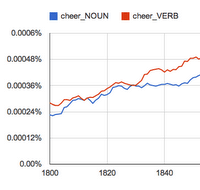 For as long as Google has been digitizing books they've been working on something called the Ngram Viewer. This is a custom search engine which searches inside all those many millions of books for the words you pick and tells you when and how often those words were used. I've mentioned the Ngram Viewer once or twice myself, and it has often been a useful tool for finding the history of a word or term. And today this tool got a lot cooler. Earlier today Google announced a number of new search options for the Ngram Viewer. You can now search for a word and only return results where it is specifically used as a noun and not a verb (or vice versa). You can find words when they are used at the beginning or the end of a sentence. That last one is gong to prove very useful for coping with spelling differences (e-book/ebook, color/colour, etc) as well as showing, like you see in the graph above, how one word or phrase supplants the other. There are so many new search options that I have only touched on the highlights. You can find a complete list of the search terms here.